1597 Commercial Street my attention was stolen by a tiny little purple and pink building on the main drag. The Custard King Drive In has apparently been an Astoria icon since it's opening in 1951. 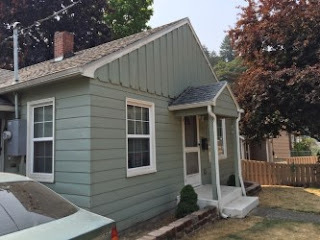 Current owners, Susan and Paul have been proprietors for the last ten years. Susan says the place had a bad reputation previous to their ownership, but she's mum on the details. 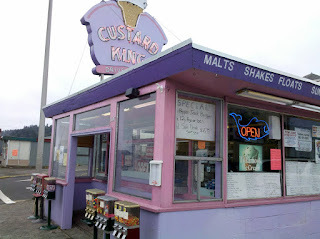 They've changed a few things since they've owned it, but mostly Custard King remains the same. One of the notable changes is the additional menu items, some designed based on customer requests and kept on the menu now like treasured friends. They still have your standard burgers but now also serve the "Dragon" which is two half pound burgers and four (yeah that isn't a typo) slices of cheese. The "Maiden burger is a 1/4 pound of meat with swiss, cedar and pepper jack cheeses. Apparently they like their cheese. The "Tower" burger includes ham and cheese, the "Blacksmith" sounded delish with ham, bacon and cheese! I can't forget to mention the "Queen" which comes with 1/8 slabs and a bun in the middle. Custard King also proudly serves beer battered onion rings, breaded zuchinni sticks, breaded mushrooms, chicken strips, BLT's and grilled cheese on sourdough. And, since it's at the coast, you can't serve food without adding cod and halibut to the menu. The sign out front says "Open 11 to 6-ish" making this clearly one of my type of places. But don't expect to sit and watch passers-by. There's one wobbly plastic white table off to the side with four metal folding chairs. I'm trying to be good with my food choices, but with a place like this I couldn't resist. I ordered up a bacon with cheese, fresh cut fries with fry sauce and a Pepsi (cause a burger isn't complete without a Pepsi) which put me back a pricey $9.10. Wow. But just look at the photo and tell me you could resist. 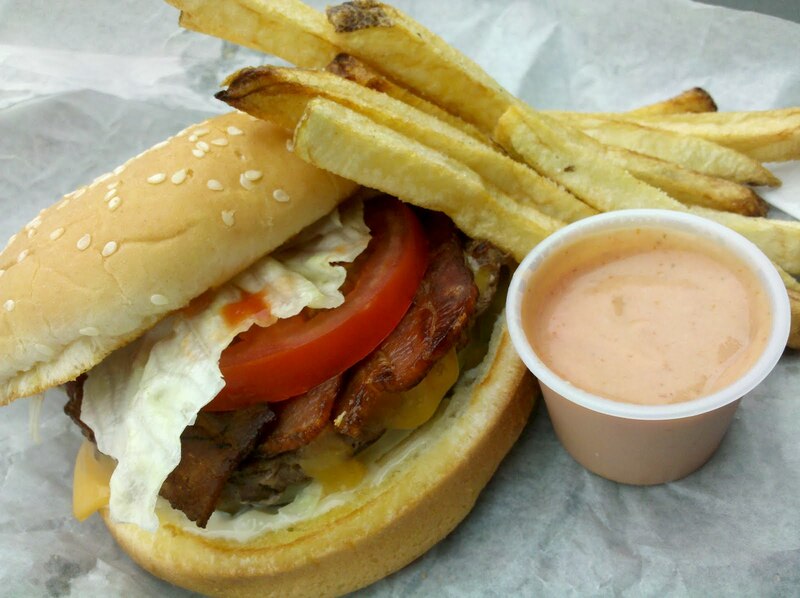 The bacon was crisp, the fry sauce splendid, and the fries...the fries are how I imagine they were back in the day. You know, when things were less complicated and more wholesome. When a man's word meant something and a handshake was all you needed to seal a deal. The food, how was the food? Well, I have to admit I was impressed with the cook as you order vibe, enchanted by the fact that they have a selection of ice creams and shakes but I doubt I'll order another $9.00 heart attack. It was good, and I recommend stopping by but the price scares me. Maybe I'll stop for a milkshake just to support the local economy. I mean after all, that's neighborly. It's the least I could do. You know, if I have to, for Oregon.